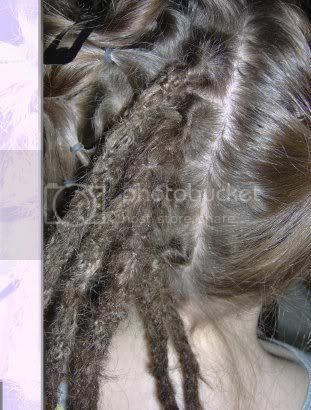 This is how you make permanent dreads with the extenders we made in my last tutorial. 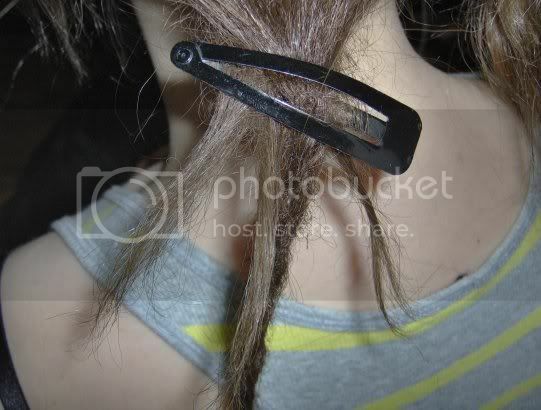 attach the extension to the backcombed part with something, a rubberband or a hairpin. split the real hair in 4.
now, it should look something like this. i tried to explain the looping part by adding red lines. and tadahhh, i full head of dreads! 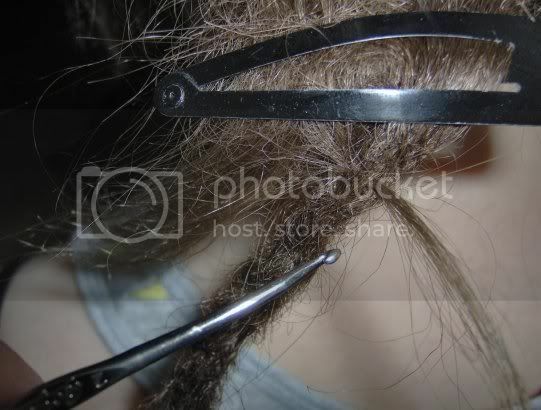 To make dreads this way is extremely time-consuming. these 40 took me about 12 hours. I send my thanks to my friend Caroline for letting med photograph her hair. We actually did them in three different occasions, but my hands were a bit sore anyway. Nice tutorial and nice work. Twelve hours is actually quite fast for a job like this, well done. I've had dread jobs that have taken that long, without the added extra of crocheting in extension. I would personally be slightly wary of applying an extension so close to the scalp on a comfort issue; as the dread inevitably fluffs up through wear, the cut ends of the extension could be mighty irritating to the scalp as time goes on. Lovely clear tutorial though and the dreads are gorgeous! thank you so much, woolhairhabit! one of the good things in crotcheting in the extension is that the real dread gets crotched at the same time. I love your tutorial! Can you tell me what length of dreadlocks you so beautifully added to your friend? Also how does the root look when they are grown out? I can imagine it would grow out like a ball kind of shape? Just wondered what maintenance tips your advise on the roots and keeping the locks looking so nice! 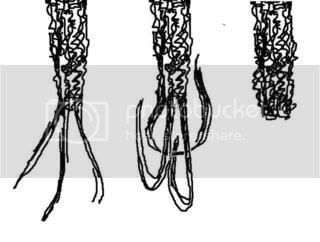 Also is it possible to crochet hook the ends back up the dread so they are blunt tipped? Thanks and amazing job on your tutorials! Im ordering my hair right now! i´m not 100% sure, because i didn´t order the hair myself, but i guess its about 50 cm? Almost 20 inch that is. the extensions came out 15-20 cm shorter, so they´re somewhere around 12 inches long? Maybe? I don´t really remember. 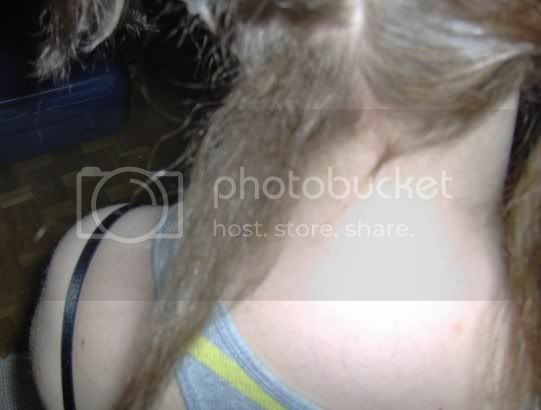 carolines own hair was about 20 cm/7 inch at the longest. You take care of these dreads just like you care for real dreads. because, they ARE real dreads. 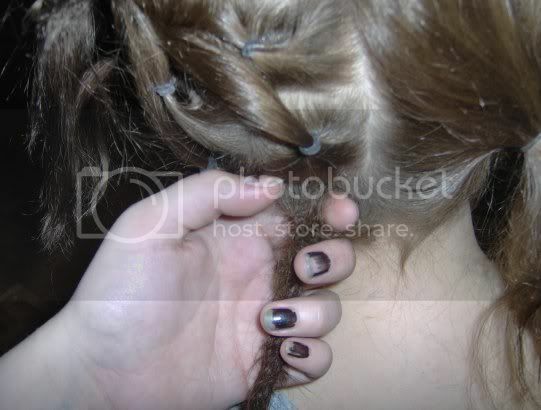 The extentions doesn´t start at the scalp, like when you braid them in. When the roots are a bit grown out, you take loose hair at the roots and rub it against your head and between your fingers, ´til it shapes like a small ball of hair. 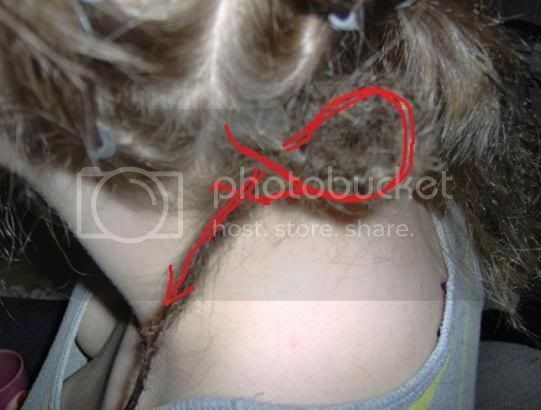 The root hair will eventually dread it self, but you can help it by rubbing the roots often, and sometimes put stray hairs into the locks with your crouchingneedle. occasionally palmrolling will helt your darlings to keep a round shape. Blund ends is no problem, we just choosed to keep them loose. I hope this nice drawing makes any sense. Looks like a turd, but are supposed to resemble a dread with a tapered, and loose end. 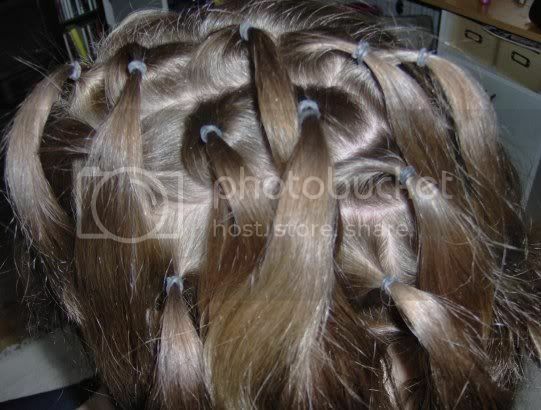 Split the loose end in three or four, and put the across eachother like shown on the pic. 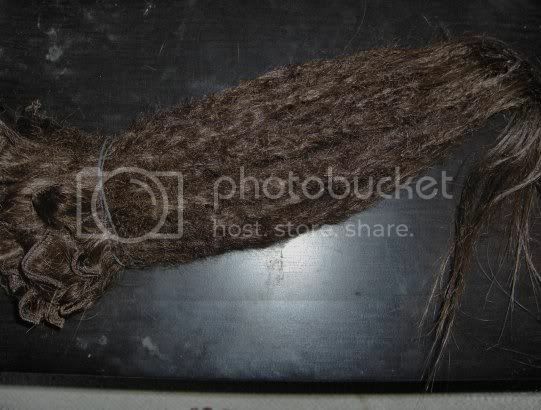 Crotched these loose strands of hair up among you dread. I really glad you guys appreciate my work, and i wish you all a happy dreadding! Last edited by catcall on Fri Mar 19, 2010 8:25 pm, edited 1 time in total. 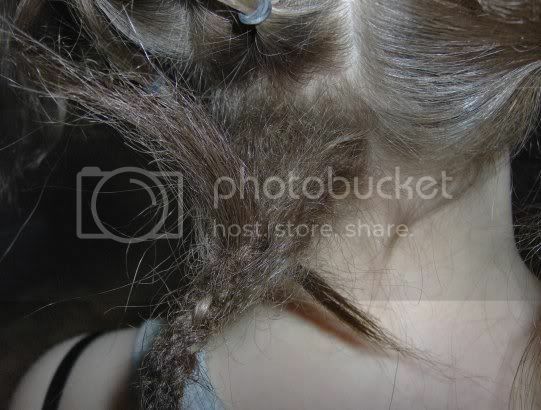 This is carolines dreads after a month in her favourite updo. I´m sad to say that she now has cut them out, she was unsatisfied with the fact that the hair she bought for me to make the dreads of just didn´t react to bleach very well. Almost not at all, infact. So make sure that you can bleach and dye the hair you use. I am glad I didnt order them too... my hair is merely 2 inches long and I have been told that I should wait till it is 3 inches before I get extensions I would like them to come down to my shoulders but just don't know what length of hair to buy... I guess I can just cut it to length lol. Its a shame that your friend cut her hair as they really looked beautiful! But at least she knows what hair to select for next time! Glad i could help. Good luck with your hair, Chris! I'm just wondering if the dreadlocks are perminent and is there any chance of them coming out? 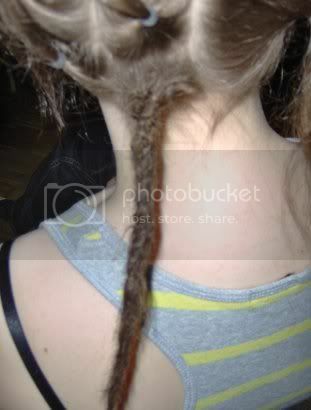 I used to have dreads and I cut them out ...so i'm looking to get them back again! That method is permanent. Just need to maintain and retighten every 6 months or so. also, how long would your hair have to be to do this??? My hair is about 2 inches but should be 2.5 by the time i put them in. that could work, but i would wait until its at least 4 inch. How much hair did you use for this? I've been thinking of doing something similar for a while now and am planning to buy some of this: http://www.doctoredlocks.com/catalog/EC ... -Straight/ but i have no idea how much to get. Great tutorial! I've used the same method with the addition of wrapping and perming the dreads in, and have had great success with my clients. 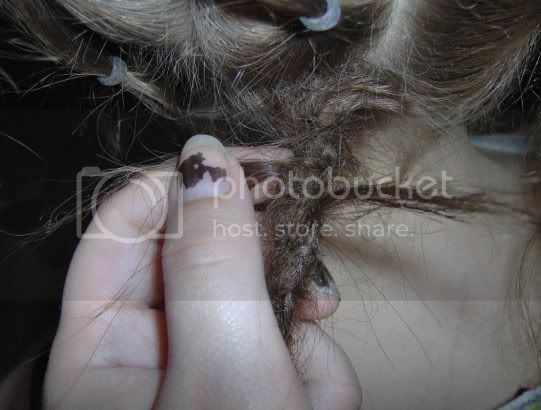 I used to use the looping method to tighten roots. 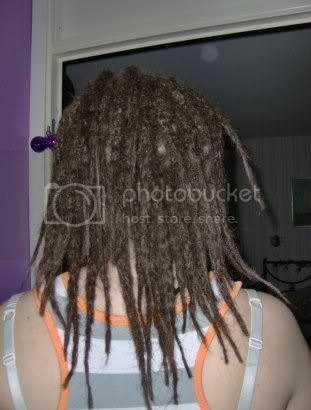 I've read since that as the dreads grow out it can cause weak spots to form in the length. Any thoughts on this?